The first of the four Starry Sky games starring the characters from the drama CD’s of the same name. Starry Sky takes place at Seigatsu Gakuen, a school which specializes in horoscopes, astronomy and other related topics. The main characters are all based on horoscopes. 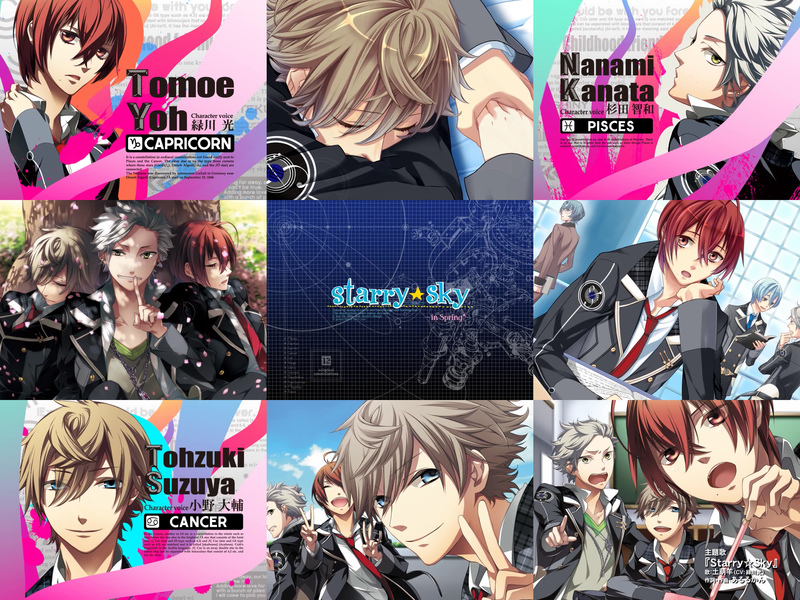 Starry Sky Spring features Suzuya Tohzuki (Cancer), Kanata Nanami (Pisces) and Yoh Tomoe (Capricorn). The singer of the opening song and voice of Tomoe is actually a pretty well-known seiyuu in Japan. His most recent role that I know of was Lancer from the Fate/Zero anime. Kyaa!! I really love the song! !